If college football is a religion, last night was Fat Tuesday. In a giant marketing expenditure shaped like a football stadium, The Ohio State Buckeyes and the Oregon Ducks put on a show for the faithful. The much-anticipated College Football Championship (do I have pay someone a dollar to write that?) was like the last day of an evangelical tent revival: players knelt in prayer, swore oaths, and sang the songs of their people. Can I get an AMEN? Today, however, the Lenten Season begins. My calendar says there are 233 days until the next Michigan football game, when I will worship my team freely once more in front of my flat screen every Sabbath, oops, I mean Saturday. Hail to the Victors! Until then, we all must wait. College football fans will have to be content with a trickle of news reports about who’s committed where, and which recruits are split seconds faster than which other recruits. We will pay way too much attention to high school athletes with big potential and even bigger biceps. Eventually there will be Spring Games, but they are nothing like The Real Thing. A Spring Game is like fish on Fridays – a sorry substitute for red meat but something we choke down anyway, having nothing else to nosh on. The red meat comes in 233 days. This time of year, I miss my weekly dose of team worship. I miss carefully selecting my team apparel each Saturday, hanging the flag outside to broadcast our religious sect to passersby, and blasting the fight song from an old marching band CD. I miss partaking in the sacrament of chips and beer. Going to church (watching ESPN) isn’t the same when college football season ends. 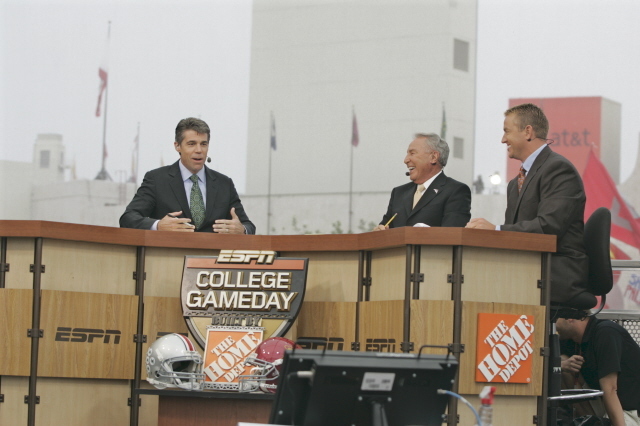 Where are the Holy Trinity of Chris Fowler, Kirk Herbstreit, and Lee Corso behind the alter of their sports desk? No one is preaching the good news, because there isn’t any. And don’t say baseball season is around the corner – that’s blasphemy. This year’s Mardi Gras, including last night’s bacchanalia, was a fun party if you are a fan of The Ohio State University. Someone in Columbus bit into the King Cake and found a baby named Cardale Jones, a third string quarterback who was raised from the depth chart by luck both good (his) and bad (J.T. Barrett and Braxton Miller). How TOSU managed to have more QB talent on its bench than most teams get in a decade is a mystery to everyone. I’m not saying Urban Meyer sold his soul to the devil, I’m just asking the question. Like all religious holidays, Fat Tuesday had to end. And like many parties at mediocre state schools not particularly known for intellectual reflection or scholarly restraint, the party in Columbus ended with dumpster fires and tear gas. Fans of TOSU can spend their 233 days of Lent nursing their hangovers and wondering if Tom Brady himself could be any better than Cardale Jones. Fans of Oregon can spend Lent taking solace in the fact that their team’s uniforms in last night’s game were virtually unrecognizable, containing no trace of their school colors (green and yellow). Unless you look very closely at slow-motion game film, you might actually believe that the Ducks had nothing whatsoever to do with that game and cannot be blamed for the outcome. Anything can happen when you have faith! Except the speedy passing of 233 days. This entry was posted in Observations and Musings, Sports and tagged Braxton Miller, Cardale Jones, College Football Championship game, ESPN, football fans, J.T. Barrett, Lent, Mardi Gras, Michigan Football, Ohio State football, sports on January 13, 2015 by lmctaggart2013.